With the Configuration Manager Areas, the overall site configuration and Alerts are managed. Bazaar Style Style: Edit layout and style at Area level and enable/disable BSS at section and page level. For an introduction to BSS see chapter Bazaar Style Style. Areas (general): An Area is separate part of the website. To a visitor of the website an Area appears as a site on its own. Areas can be public (accessible to everyone) or private. Private Areas (also called Intranets) are only accessible with a login name and a password. Set Public/Private: Once an Area is created (either public or private) the choice cannot be made undone. This is a security feature. Set Active/Inactive: Any time public and private Areas can be set to active or inactive and vice versa. Inactive means that pages and sections in that the Area are completely inaccessible, even if the URLs are known. Merge/Split: The content of Areas can be merged with other Areas. An Area can also be split into more Areas. Merging or splitting are done in the Page Manager, section 3.3 Advanced: Edit advanced properties of page n.
Add: Add an Area to the site, set its name, select public or private Area, set data folder name, select theme for the Area. 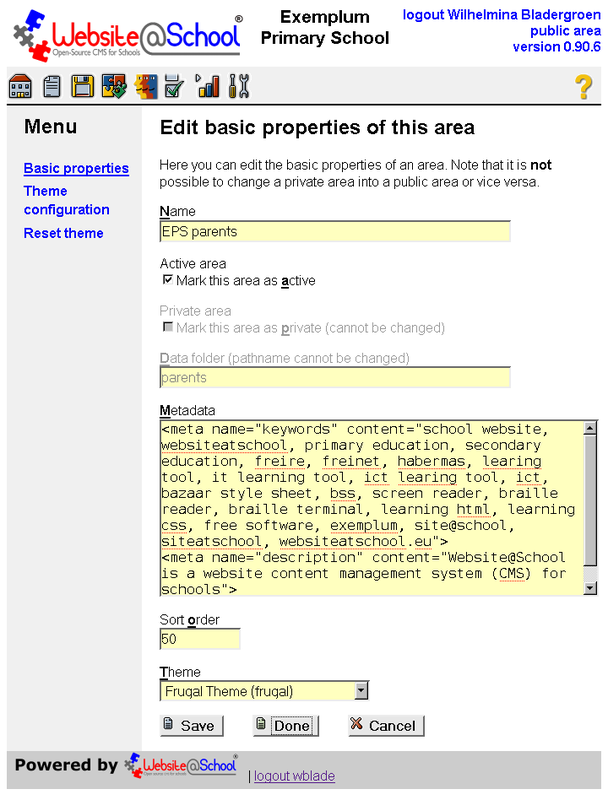 Basic properties: Edit the basic properties of the area: name, area active/inactive, add meta data to the pages in the Area, select the theme for the area. Theme Configuration: Configure the options for the chosen theme. The available options depend on the chosen theme. Please see the Table of contents for the available themes. Reset theme: Reset the theme to its default values. This feature is for pupils that learn CSS. When they have created a mess, they can return to basic settings. Delete: Delete an Area. The Area must be empty, i.e. all sections and pages must be moved or deleted. Home: Set the Area as the 'home' i.e. starting point of the site. Sort order: In the list of Areas the desired order can be set. In fact, every configuration option is a feature. No need to list them here. Please see the section 4. Site where all configurations options are discussed. Unlimited number of alerts: the webmaster can add an unlimited number of alerts. Fine-grained selection: alerts can be added to 'every' change, any change in an area, any change in a section or a change on a particular page. De-activate: alerts can (temporarily) be suspended. 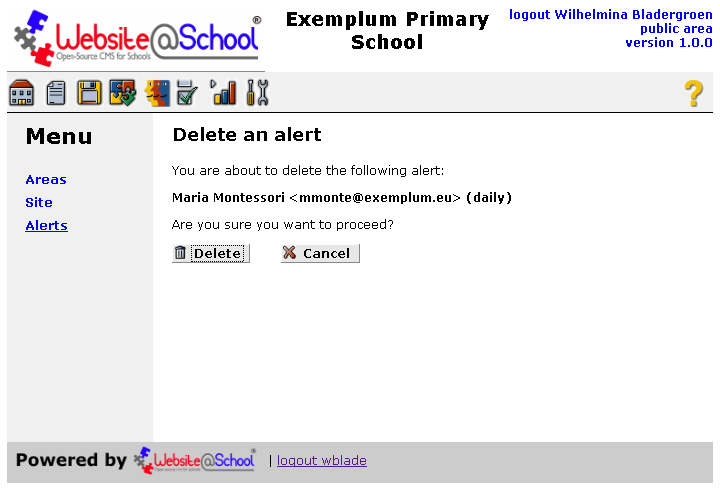 After Website@School installation with demodata, two alerts are automatically installed. The first one is a daily alert to the e-mail addres of the person who installed Website@School (Wilhelmina Bladergroen in our examples). 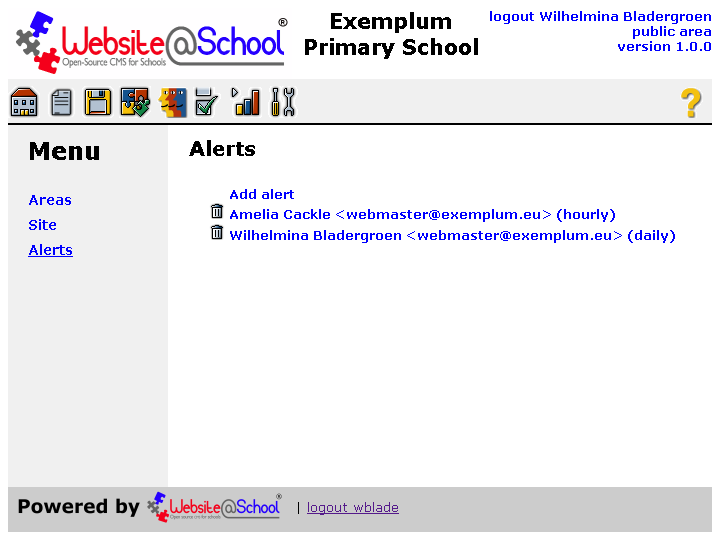 The second one is an hourly alert for changes in area 2 (Exemplum Intranet) to Amelia Cackle, using the same e-mail address. This chapter elaborates on other chapters. We assume you have read and done the General part of the Table of Contents. Areas: Clickable link to the Area manager, discussed in 3. Areas. Site: Clickable link to the Site manager, discussed in 4. Site. Alerts: Clickable link to the Alerts manager, discussed in 3. Alerts. Workplace: Pane to manage the various options of the managers. No manager selected. Areas resemble sites; to the site visitor Areas appear as separate sites. This section discusses adding Areas, editing their properties, the Areas' theme configuration and deleting Areas. The list of areas is shown, the Areas link is underlined. Add an area: Link to the Add an area dialogue. See section Add an Area. Home icon: A visible home icon indicates the default (opening) area of the site. grayed out home icons indicate that these areas are not the opening ones. When no Home icon is set, the Area with the lowest number in the sort order will be the opening Area. For Sort order, see section Edit basic properties of this area. Trashcan icon: To delete an area, it must be empty. Pencil icon: Clickable link that gives direct access to the theme configuration. 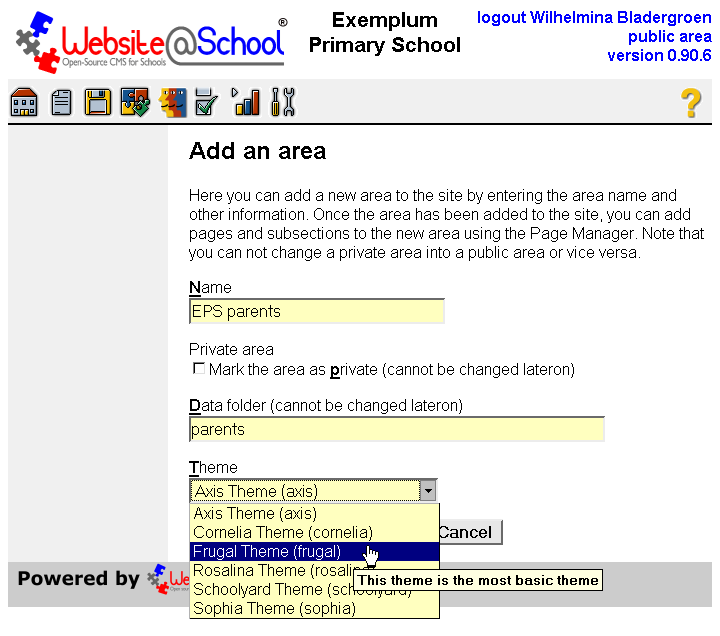 See section 3.4 Configure theme 'themename' for area nn. (public/private )Name of the area (nn,nn) (inactive): One clickable link that gives direct access to Edit basic properties of an area, see section 4.3 Edit basic properties of this area. (public/private): Whether this is a public or a private area. Name of the Area: The Area name will be displayed on the website. (nn,nn): The first number indicates the number of the area. It is given to the area when the area is created. The last number indicates the sort order in this row. (inactive): The site is not operational, invisible and cannot be found, even when the URL is known. Name: Enter the name of the Area. The name is visible in the theme and in the browser title, i.e the wording you see at the very top of your browser. The name may contain dicritical characters. Enter at least a space; this produces no name at all. This can be useful in some themes. Private area [ ] Mark this area as private (cannot be changed later on): A private are is a non-public area, i.e. 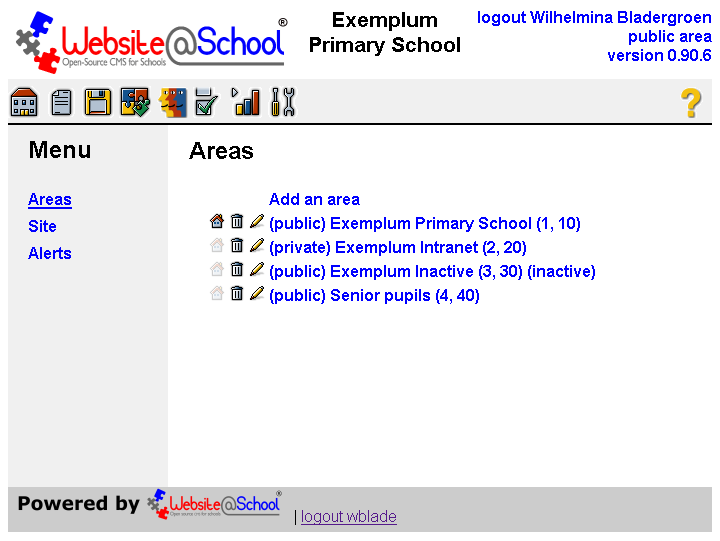 an Intranet, only accessible with a username and password. Take care! Once an area is selected as a private area, it cannot be changed to a public area. Also, when an area is selected as public, it cannot be changed to a private area. This is a security feature. Data folder: Enter the name of the data folder for this area. Accepted symbols are: [a-z], [A-Z], [0-9], '.' (dot), '-' (dash) and '_' (underscore). The folder name must start with a character or digit and spaces are not allowed. If the name is not acceptable, this results in an error message. Website@School tries to construct a suitable directory name based on your input. If this occurs, accept the suggested name or enter a name that is acceptable and click [Save]. Every area has an associated data directory. In general files that belong to an area should be stored in this directory. Note that every user also has a personal data directory. This directory should be used for personal files only, and not for files related to the area. Theme: In the dropdown menu a theme for this area can be selected. 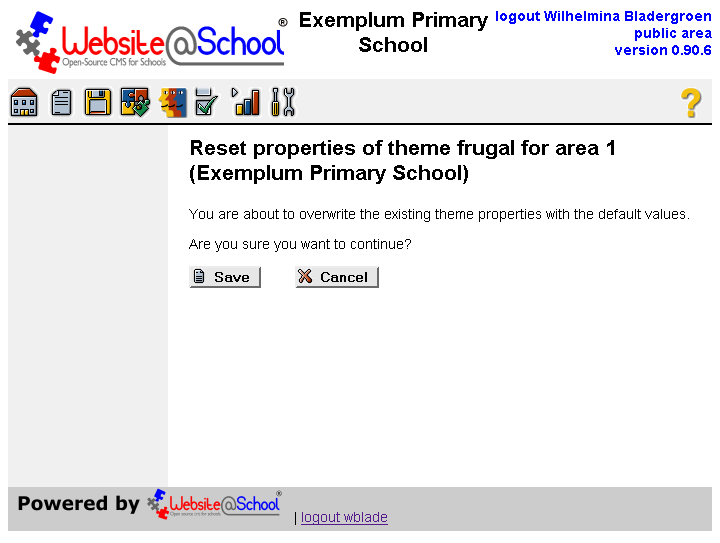 A theme is a set of configurable properties. Together the configured properties define the visual appearance of an area. The configuration of the properties is done in the Configure theme 'themename' for are n dialogue, see 3.4 Configure theme 'themename' for area n.
The theme can be changed to another theme. The old theme and its configured properties are retained, so you can return to the previous theme and it's configured properties, provided you have not reset it's configuration to default values. In this way, one theme can have many configurations of its properties, thus quite differing visual appearances. Save, Done, Cancel: Please see Save, Done, Cancel in the Basic procedures for beginners. In the Menu the Basic properties link is underlined. Name: The name of the area can be changed. The name may contain diacritical characters. Active area [ ] Mark the area as active: - Active: an area must be active before any files can be served. - Inactive: if an area is inactive, it is as if it does not exist. But, the rule of thumb is: everything is public except what is not public, so please read the notice below. 1. In general any file in the data folder of any active public area can be retrieved by anyone as long as the name of the file is known. 2. If an area is inactive, no files can be retrieved, even if the name of the file is known. In other words: once an area is inactive, to a visitor it appears that neither the area nor the files exists anymore. The same active/inactive conditions also apply to pages in areas. Once an area is inactive, to a visitor it appears that the pages in that area no longer exist. Even if the URL of the page is known, the page cannot be retrieved. Private area [ ] Mark the area as private (cannot be changed later on): The checkbox is grayed out, i.e. you cannot use this option. Once an area has been selected as public or private in 4.2 Add an area, this selection cannot be undone. Data folder (pathname cannot be changed): Once set in 4.2 Add an area, this path cannot be changed. Here valid HTML code can be added as it is used between the >head< and </head> tags. The code added here can be understood by search engines. For an overview of possibilities and exaggerated expectations see for example http://searchenginewatch.com/2167931 and for an explanation http://www.w3schools.com/tags/tag_meta.asp, a link about keyword phrases http://www.seologic.com/faq/keyword-optimization. 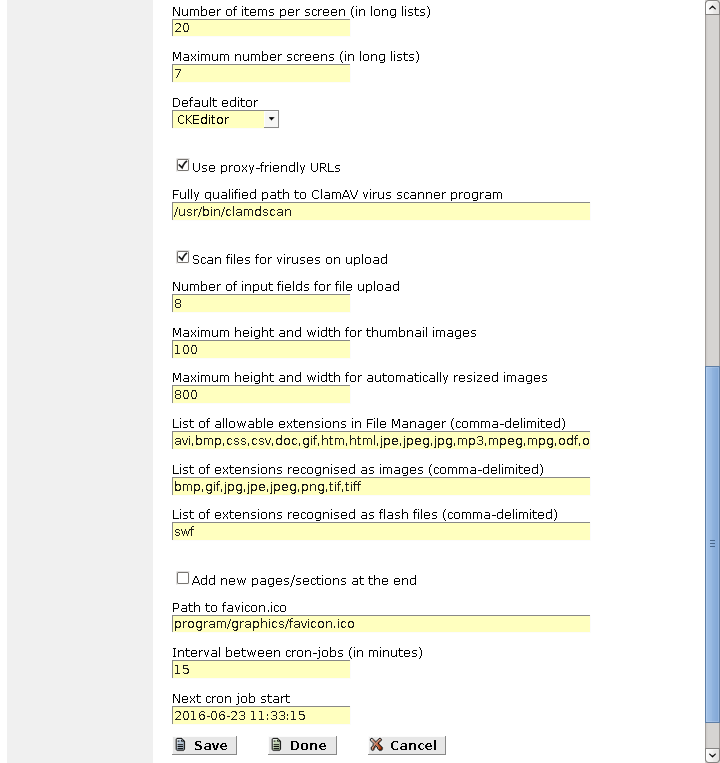 Sort order: The order in the list of areas, as shown in the Areas overview and the Page Manager overview. It's the second number in the name of the Area. With every created area the number is increased with 10, enabling you to add other numbers in the row, thus creating an easy to use list. When the sort order numbers were changed, the user has to logout and login again to have access to the Page Manager. Theme: To change the theme. When changing to another theme, the old theme configuration of the area is retained, so it's possible to go back to the previous theme and its configuration. Here the properties of the previously chosen theme can be configured. Each theme has its own configuration options, which are discussed in their respective chapters. Please go to the Table of contents, section Themes and select the chosen theme to configure its theme specific options. Resetting the theme properties restores the properties as they were set during the installation of the theme. Take care! It is a good idea to copy and paste complex style information to a safe location before resetting a theme. In general it's a bad idea to delete an area. Maybe it contains content that now seems useless but that might become useful in a year or so. Maybe it's a better idea to rename the area as Archive: [old areaname], make the Area inactive and put it at the bottom of the list of Areas. Delete: To delete your work and return to the area managers main screen. Cancel: To cancel your unwise action and return to the Page Manager main screen. It's wiser to make the Area inactive. In the Site configuration the global parameters for the complete site are set. In a normal school situation it's not necessary to change any of these values. If you do not know what you are doing here, it might be better to leave the Site configuration untouched. - An external version number: i.e. the release number, for example 1.0.0. - An internal version number: for example 2016062900. This number is composed as yyyy-mm-dd-serialnumber. It indicates the version of the database structure. As soon as the database structure is changed, this version number also changes. Do not change the number because it's is used when installing updates. See also section 6. Update Manager in chapter Tools. Security code: It's a SALT. In cryptography, a salt consists of random bits that are used as one of the inputs to a key derivation function. The security code is a quasi random generated string. Each Website@School installation has its unique security code. This feature makes the session key unique, which adds extra security to passwords and prevents taking over a session. It's a security feature. Session name: WASDATA is the name of the session cookie. Changing this name adds a bit of extra security. After changing the name, it's necessary to log out and log in again. Session expiry interval (seconds, default 86400): Defines when a user session is timed out, in this case after 86400 seconds, i.e. one day. After one day of user inactivity, the session is timed out, the user is logged out and an error message is displayed. See also section 4. Error messages in chapter Logging in and out. The expiry interval can be a point of discussion. It can be lowered, in which case the risk of losing work becomes higher. It can be extended which blocks a page in use longer, resulting in error messages for another users who want to edit that page. The best option is to leave it as it is and to save! 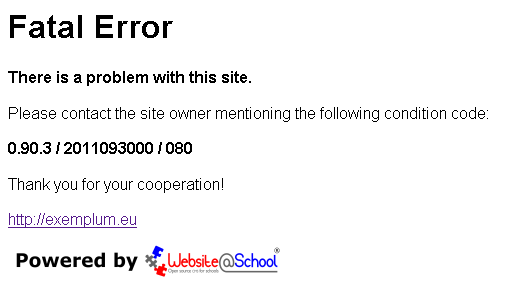 your work often and/or deploy some other activity in Website@School management, in which case the session time is renewed, every time you click something. Maximum allowed login attempts (default 10): After a maximum of 10 wrong logins, the user is asked if he wants to go to the 'Forgotten your password? procedure. If he persists in logging in, he is blacklisted. See items below. This is a security feature. Login failures interval (minutes, default=12): The time window in which the blacklist is consulted before deleting a users failed login attempts. So, a user has to wait 13 minutes before he can undertake a new login attempt. This is a security feature. Valid bypass interval (minutes, default 30): This item refers to the 'Forgotten your password?' procedure. After sending the first mail, containing the one time code, the user has 30 minutes to read and enter the one time code. If the time is exceeded, the one time code expires. After the one time code is successfully entered, a second email is sent with the temporary password. Again there is 30 minutes time to renew the password. If the time is exceeded, the temporary password expires. This is a security feature. It's easier to remember your password than to do the forgotten password procedure. For details, also see section 3. Forgotten your password? in chapter Logging in and out. Blacklist interval (minutes, default 8): The time a user is put on the blacklist. In this period, the system is unaccessible for that user. Website title: The text between the <title> and </title> tags. 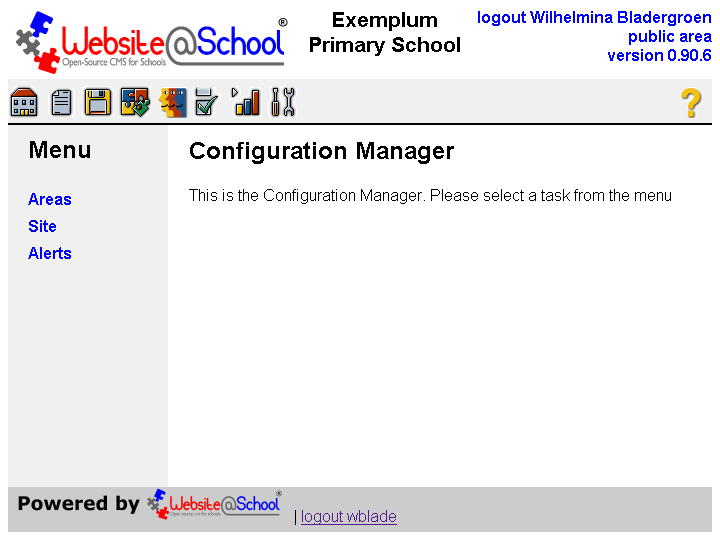 This title is only visible in Website@School Management and in the browser title bar. The title is not visible on the site. This field may be left empty. In that case it is not shown in the browser. This is a feature for users with a braille terminal or screen reader. Website From: e-mail address: This e-mail address is used for outgoing mail, e.g. alerts and password reminders. This feature enables a From: address that differs from the Reply-to: address. The From: address must be a valid e-mail address from the sending mail server. 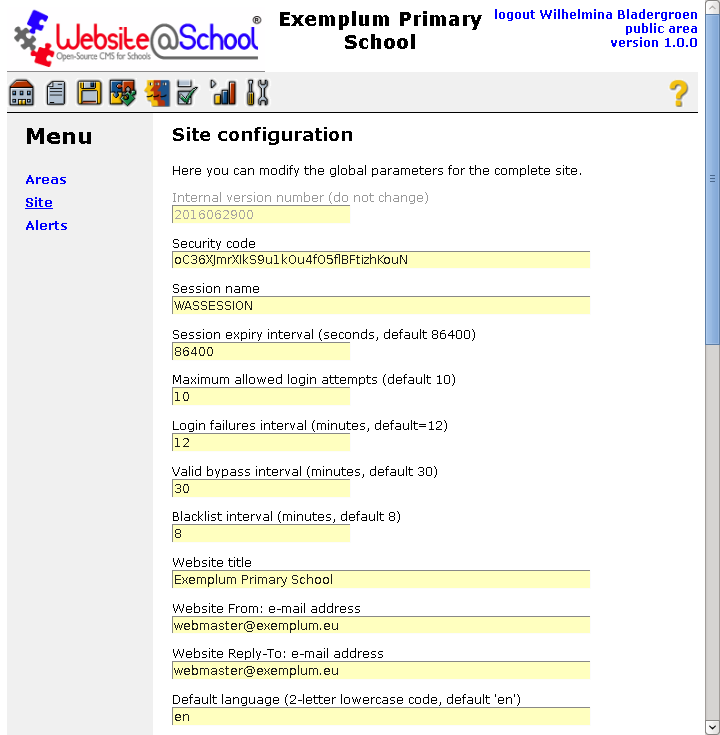 This is a useful feature when Website@School is installed at an ISP (Internet Service Provider) that uses an address like exemplum@isp.com, in case the ISP has no valid address for the webserver at that domain. Also read the next item below. For details, see RFC 5322: Internet Message Format on http://tools.ietf.org/html/rfc5322 (opens in a new window). Website Reply-To: e-mail address: For example the webmaster Wilhelmina Bladergroen: w.badergroen@exemplum.eu, or webmaster@exemplum.eu if you prefer a functional address. Default language (2-letter lowercase code, default 'en'): The language that is used in the login screens and on the site itself, e.g in the [Go] button in the Areas dropdown menu. Also see section 3.2 Add a new language in chapter Tools, where the two letter code is used when adding a new language. After logging in, the user can have her preferred language, also see chapter Account Manager, under 3.2.1 Basic, under Lanuage and Redirection (where to go after login). Number of items per screen (in long lists): This feature cuts long lists in manageable screens, for example in lists like the Log viewer in the Tools Manager, or the list of all users in the Account Manager. Page 4 is visible now and is in the invisible 'window' that tries to keep the used page in the middle of the row for easier searching and navigation. Try it and enjoy. Default editor: When a user is created, this is the default editor. CKEditor: the default WYSIWYG (What You See is What You Get) editor, also the best choice for blind and visually impaired. What a difference one character makes :-). FCK editor: a WYSIWYG editor for older browsers. Plain editor (Text Area), to edit plain HTML. In the user properties a user can select her preferred editor. Also see chapter Account Manager, section 3. Users. - With a new installation, the CKEditor is selected as default. - With an upgrade the existing accounts keeps their selected editor (FCKeditor or Plain editor). New accounts get the editor as set in Configuration > Site. - In case of an upgrade, the default editor is only changed to CKEditor if the FCKeditor was the previous default editor. If the Plain editor was selected in the previous version, the default editor stays Plain. Obviously the webmaster had good reasons for selecting it. - Proxy friendly: Produces a file path like, for example /file.php/areas/exemplum/image.png. Why proxy friendly? Many proxy servers see the question mark in the path as dynamic data which they do not buffer because 'dynamic' means the data can differ after each request. However, an image is static data and thus does not change. When the question mark is in the path, the proxy server will still request the image from the server, over and over again. This feature is useful, for example in a school with Website@School installed at an ISP that has little or expensive bandwidth. If the school has a proxy server, each time pupils request a certain page with static data, the server gets it from the proxy servers cache and not from the server somewhere on the web. 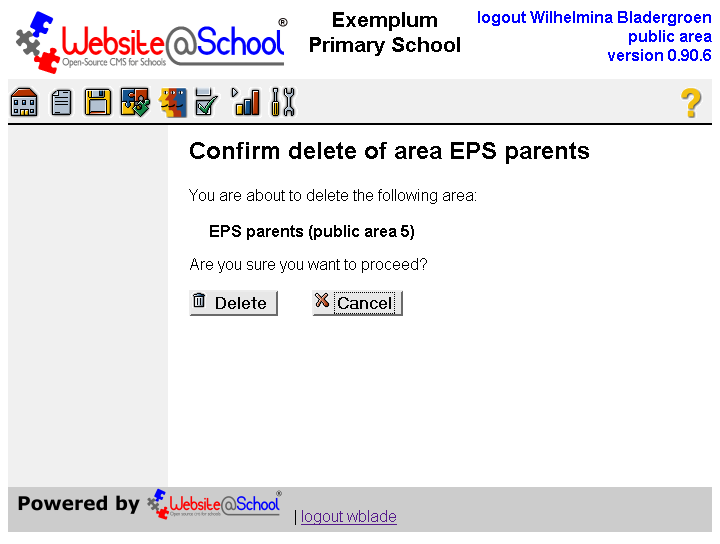 Do not change this setting after your Website@School installation is already in use for some time. It could be the case that you have to update a lot of links. After the installation, check if proxy friendly URLS function. If not, uncheck the box. Then create users. Fully qualified path to CLAMAV virusscanner program: During the installation, the install wizard tries to find the path to the free (not as in beer) CLAMAV virus scanner, but not other virus scanning software. If found clamdscan is the first preference because of it's speed. Otherwise, if available clamscan is used. If one of them is found, the box (see below) is automatically checked. If, for some reason, the box is checked and the virus scanner does not function, this results in an error message. It's a good idea to check the virus scanner after installation. Also see chapter Installation, section 4. After the installation. [ ] Scan files for viruses on upload: See above. If unchecked files are not scanned on upload. This is a security risk. On a school server it's virtually impossible to prevent the upload of malicious material. Maximum number of files per upload (non Java): That says exactly what it is. Also see chapter File Manager, section 3. Managing files. Maximum height and width for thumbnails: Thumbnails are automatically created  for the FCK editor in a 100 pixels square, in which the image always retains its aspect ratio. The longest side, either horizontal or vertical, is reduced to 100 pixels. This keeps thumbnailed images undistorted and image lists in a proper, well spaced row. If supported by GD, see the next item. Maximum height and width for automatically resized images: Default is 800 x 800. Sets the maximum size (width or height, depending on landscape or portrait format of images). List of allowable extensions in File Manager(comma delimited): Only allowed extensions, entered comma separated with no spaces. Thumbnails are created with the GD support. Also see chapter Installation, section 2.7 Compatibility which image extensions are supported. Also see chapter Editors, section 2. FCK editor. List of extensions recognised as images (comma-delimited): Only allowed extensions, entered comma separated with no spaces. The FCK editor recognizes images and shows them as thumbnails when inserting. Unrecognised images extensions, for example .bmp are shown as question marks and not as thumbnails. Also see chapter Editors, section 2. FCK editor. List of extensions recongised as flash (comma-delimited): Only allowed extensions, entered conna separated with no spaces. The FCK editor als recognises the flash extension. [ ]Add new pages/sections at the end: Default, newly created pages and sections are set at the top of the Area or a section. When this option is checked new pages appear at the end of an Area or section. Path to favicon icon: this field accepts a path to a .ico-file. Often this small graphics file is displayed in the address bare of the browser. The default is program/graphics/favicon.ico. This is the Website@School favicon.ico file. You can replace this with your own .ico file, e.g. /file.php/areas/exemplum/exemplum.ico. This will associate your website with the image in exemplum.ico for your website visitors. Interval between cron-jobs (in minutes): this parameter limits the number of times that cron.php really performs housekeeping chores. If the last run was less than interval minutes ago, nothing happens. This helps preventing Denial-of-Service attacks. The default value for interval is 15 minutes. See also section 4.4 Configuring cron.php in chapter Installation. Next cron job start: this field indicates when the current interval ends and hence when Website@School will actually perform houshold chores. You don't have to change anything in this field; it is updated automatically whenever cron.php is successfully called. If no cronjob is installed (see section 4.4 Configuring cron.php in chapter Installation) this field will show a dat from the past, e.g. 1000-01-01 00:00:00. If you see this value in this field then the cronjob has not yet been executed. [Save], [Done], [Cancel]: see section 2.3.3 Save, Done and Cancel in the chapter Basic procedures for beginners. Press [Done] to save your changes and return to the Configuration Manager overview. 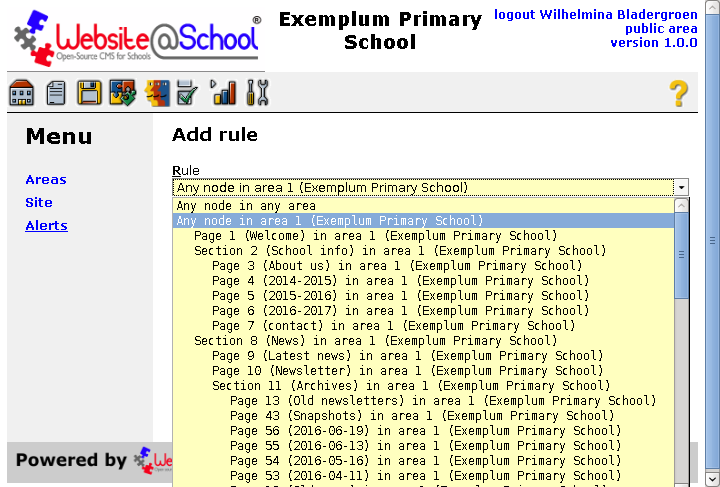 Alerts associate sets of 1 or more rules selecting pages and sections with an e-mail address. Every time something changes on one of the selected pages and sections an alert message is added to a buffer. Once it is time to process the alert messages an e-mail containing the accumulated messages is prepared and sent to the corresponding e-mail address. The frequency of sending alert messages is configurable, from 'every hour' to 'weekly'. 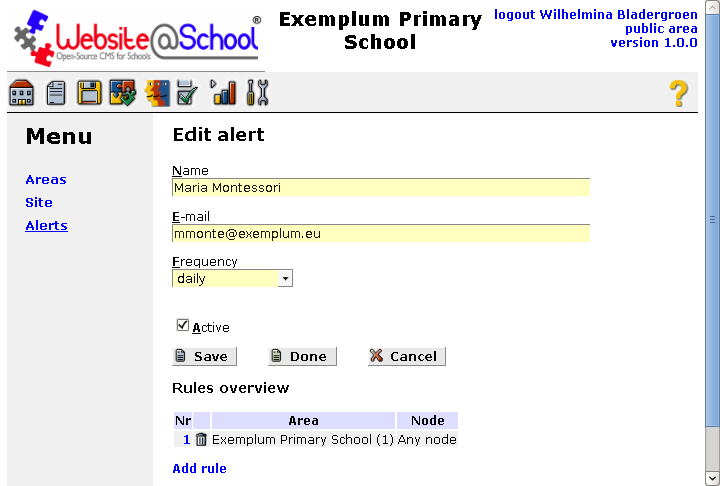 An alert can be associated with 0, 1 or more rules. In order for the alerts to work properly, cron.php must be configured correctly, see section 4.4 Configuring cron.php in chapter Installation and also the option Interval between cron-jobs (in minutes) in section 4.1 Site configuration above. In the Configuration Manager Menu, select Alerts to enter the Alerts dialogue. Add alert: add an alert, see section 5.2 Add an alert below. Trashcan icon: delete an alert, see section 5.4 Delete an alert below. Name <e-mail address> (frequency): edit an alert, see section 5.3 Edit an alert below. To add an alert, click Add alert. The first of two dialogues is displayed. Name: the human-readable name of the person associated with this alert. Frequency: how often will alerts be sent? The options are as follows. [Save]: press this button to save the alert and continue with adding rules to this alert. [Cancel]: press this button to cancel the operation. Press [Save] to continue. The second dialogue (Add rule) will appear. Rule: select a rule from the drop down list. This list not only contains an entry for each of the currently existing pages and sections but also allows generic rules, e.g. 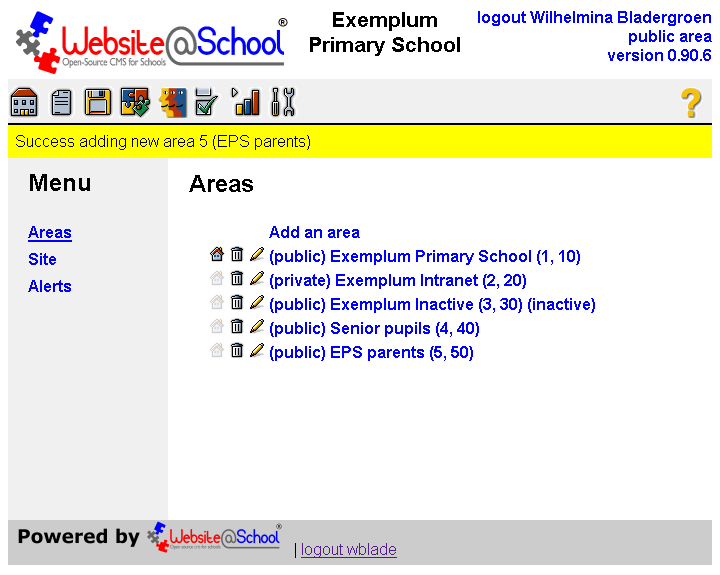 Any node in area 1 (Exemplum Primary School). This makes it possible to receive alerts whenever a new page or section is created. [Save]: press this button to save the rule. [Cancel]: press this button to cancel the addition of a rule to the alert. Press [Save] to continue. The Edit alert dialogue appears. Here you can change all aspects of the alert, including adding, editing or deleting rules. See section 5.3 Edit an alert below. To edit an alert, click Name <e-mail address> (frequency). The following dialogue is displayed. Frequency: how often will alerts be sent? Active: if this box is unchecked, no messages will be sent. Later the box can be checked again, to re-activate the alert. [Save]: press this button to save the alert and continue editing. [Done]: press this button to save the alert and return to the Alert overview. [Cancel]: press this button to cancel the changes to this alert. Rules overview: this is a table with an overview of all rules associated with this alert. Nr: click on a number in this column to edit the corresponding rule. In the dialogue that opens you can select a different rule from the list. Press [OK] to confirm the change of this rule, or press [Cancel] to keep the rule as it was before. Trashcan icon: delete a rule from this alert. The following confirmation dialogue is displayed. Press [Delete] to confirm the removal of this rule, or press [Cancel] to keep the rule after all. Add rule: click on this link to add a new rule to this alert. Click on the Trashcan icon to delete an alert. The following confirmation dialogue is displayed. Press [Delete] to confirm the removal of this alert and all associated rules, or press [Cancel] to keep the alert after all. 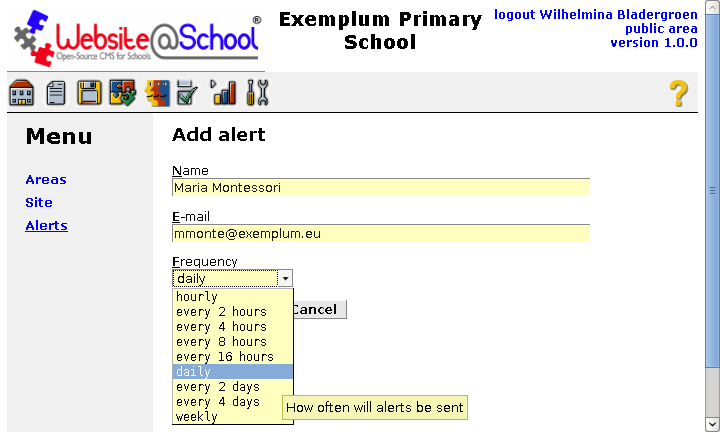 You can make an alert for a teacher on a page owned by a pupil. When the pupil changes something on his page, the teacher receives an alert, only for that specific page. You can create an alerts for Catherine and Andrew for the Althing page with their chocolate research (see chapter Althing (weblog)). This way they can receive alerts whenever something changes in that page. The e-mail addresses of the alerts are not bound to an account, but are completely separate. This is done to be able to send alerts to addresses that have NO account. In this way, a visitor can take a subscription to the changes on a certain page. For example: subscribe me to this page with the advertisement 'for sale'. When something changes in the price of the advertised articles, the visitor automatically receives an alert.